Fratella is a deliberate bastardization of masculine and feminine conjugations of the Italian language. Being new to the foreign words Fratello and Sorella, my roommate and I found it difficult to remember the proper terms for “brother” and “sister”, and eventually it became an inside joke to say the words wrong. Calling Florence home, this became a tongue-in-cheek play on the misuse of the Italian language by tourists. 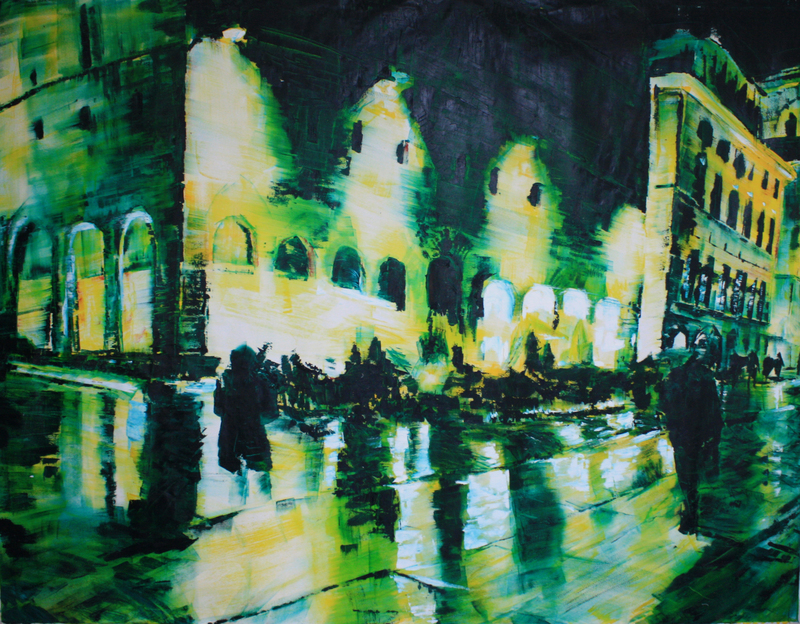 The depiction in this piece is from when my sister Cori came to visit in Florence in February. She is standing in front of a restaurant in a popular tourist area, Piazza della Signora. My sister, a foreigner, is found in a place in Italy commonly overflowing with foreigners. An issue within contemporary culture I find particularly distressing is The NHL Lockout. A lockout was established once the previous Collective Bargaining Agreement expired, and the players’ union, the NHLPA, and the NHL owners were unable to come to terms on distribution of the league revenue. 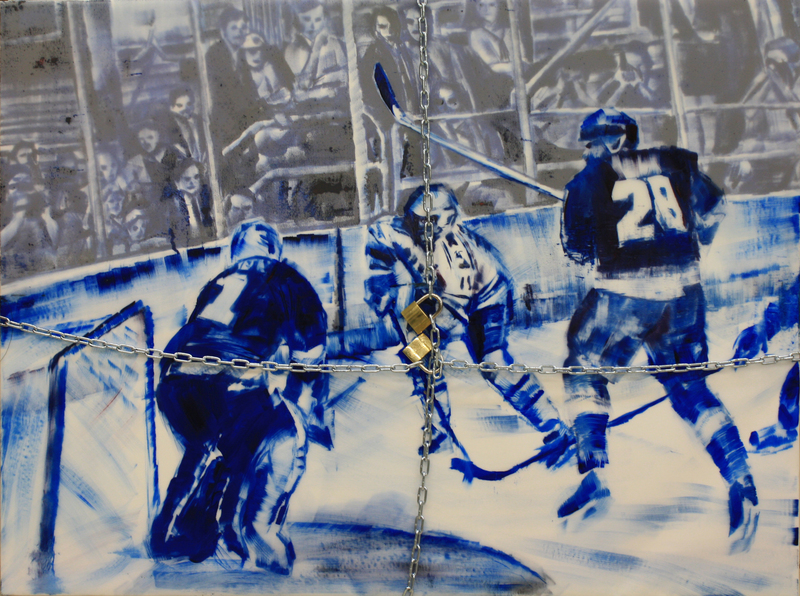 The fact that I chose to depict a hockey-related issue in a series of paintings is to acknowledge a disapproval of the situation from fans around the world. Regardless of sides and who has more claim to the league’s 3.3 billion dollar annual revenue, the issue is the league’s disregard of both their fans, their employees and their players as a commodity. This has an adverse effect on all those whose careers depend on NHL profits. 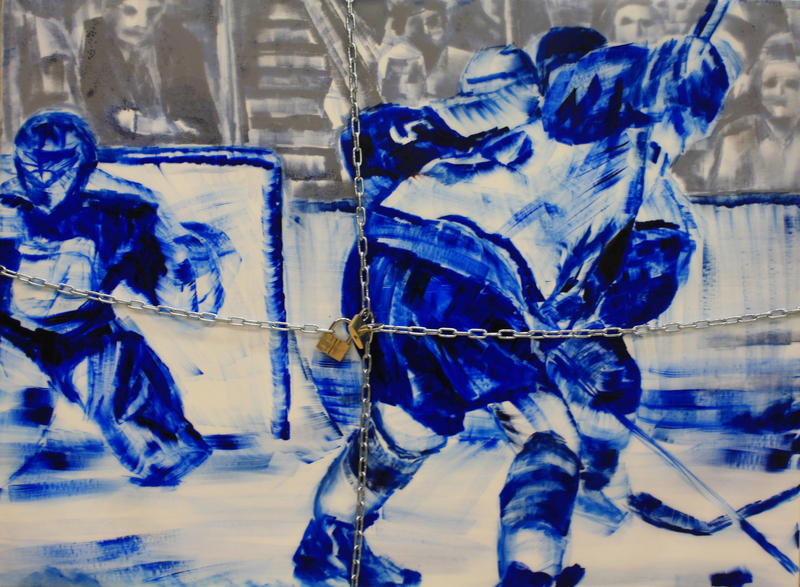 In this series of oil paintings, Locked Out: Messier Vs. McClean ’94, Conroy Vs. Khabibulin ’04, Parise Vs. Quick ’12, I wanted to show that the fans, and also photographers to represent the workers, are clearly taking a backseat in this situation. 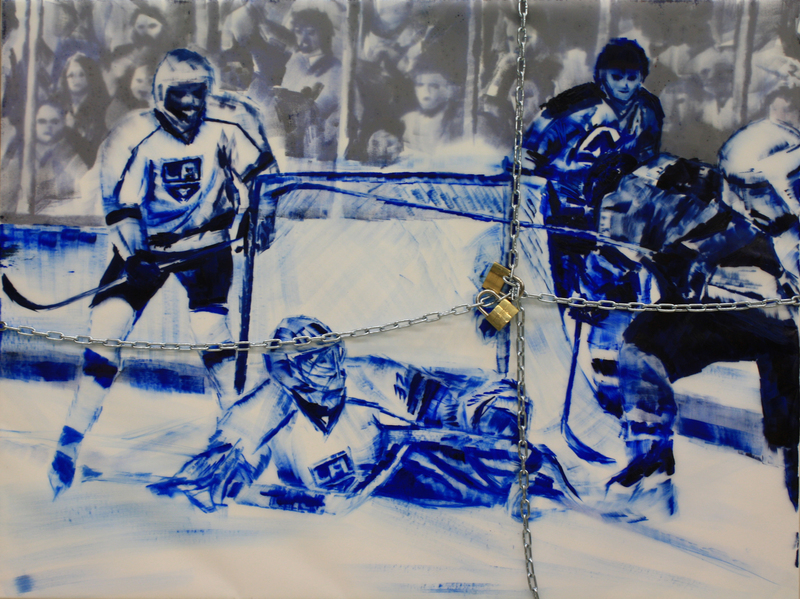 I achieved this effect by painting the crowds down on the canvas in oil, then adding a layer of mylar paper in order to both blur the fans and make the hockey action more distinct. Despite that we are the structure on which everything stands (the canvas), the fans are not as clearly visible within the context of the image. There have actually now been three separate lockouts within the past eighteen years. Therefore, I chose to source the imagery for each work from the Stanley Cup Finals match up that occurred before the league shut down each year (in ‘94-‘95, ’04-’05, and now the start of ’12-’13). Each image has been sourced from some of the most vital moments of these series’. I also wrapped chains and locks around each image in order to imply that each of these moments have been stopped at perhaps the most crucial moments from these games. For example, in the ’94 playoffs between Vancouver Canucks and New York Rangers, Rangers captain Mark Messier literally guaranteed he would lead his team to victory in Game 6. Sure enough, Mess delivered, and this impetus led to New York breaking their curse of not winning the Cup in 54 years. You just do not pause the game at such an exciting moment, man! My work has halted this excitement. I’ve locked the viewers out of full appreciation of my paintings, somewhat neglecting my relationship with my viewer to reflect the NHL’s disregard for their fans. Finally, I chose to represent both fans and the players with high contrast and energy, blurred in a black/ blue and white monotone to give the impression of old, vintage film reel. This is to subtly show that Hockey is part of our heritage; the reason why this whole situation affects us as fans so poignantly. This colour scheme ultimately unites the players and the crowds, in order to connote that the main issues are the locks. Recently, I have been following a metalcore band from Halifax, A Sight For Sewn Eyes. I had the opportunity to see this group play live at Scenefest in St. Catherine’s. The rowdiness of the band, coupled with the overcrowded bar’s poor lighting, meant none of the pictures I took turned out well. Guitarists moved too much, lights flashed, the drums and crowd were a huge mess of shadows. When it came to sourcing from social media, I was intrigued that I was capable of translating a digital search and continuous band allegiance into a painted interpretation of A Sight For Sewn Eyes’ chaos, especially after having experienced said chaos firsthand. The name Surrogate Eyes has two defining meanings: that I am translating my experience of this show’s excitement to show others through my interpretation, and that I have, as a fellow artist (in a different medium), become another “Eyes” member. I found the same reckless abandon with this canvas that bands do with their instruments. This piece became largely performative; the canvas my guitar, the studio my stage. My visual noise dismembers what may be expected from an oil painting, the way that the metalcore subgenre turns conceptions of music on their heads. This work visually re-imagines and illustrates how an audience member at a metalcore show gets physically (and more often than not, violently) excitable and is meant to show that hearing a band online and seeing a band live are two entirely different things. Its not meant to be beautiful, or accurate. It’s dirty, it’s loud, and it’s live.